Nancy Bertler and her team drilled out hundreds of ice cores a half mile thick. 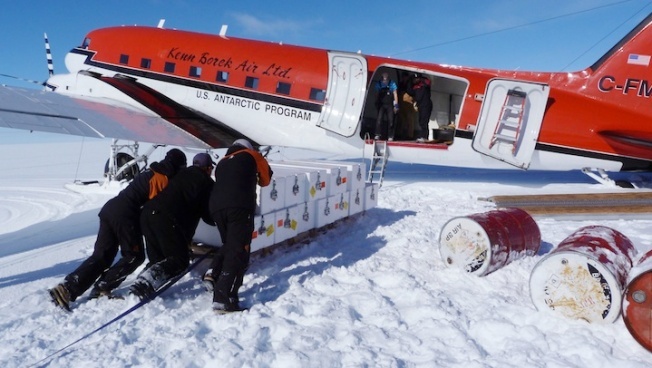 Scientists and staff push a sled containing crates of ice they've collected in order to load them on a plane. The continent's pristine habitat provides a laboratory for scientists studying the effects of climate change. Nancy Bertler and her team took a freezer to the coldest place on Earth, endured weeks of primitive living and risked spending the winter in Antarctic darkness, to go get ice — ice that records our climate's past and could point to its future. They drilled out hundreds of ice cores, each slightly longer and wider than a baseball bat, from the half-mile-thick ice covering Antarctica's Roosevelt Island. The cores, which may total 150,000 years of snowfall, almost didn't survive the boat ride to New Zealand because of a power outage. Bertler hopes the material will help her estimate how long the Ross Ice Shelf would last under the current rate of climate change before falling apart. Evidence from the last core her team hauled out needs further study, but it contains material that Bertler said appeared to be marine sediment that formed recently — at least in geological terms measured in thousands of years. That would bolster scientists' suspicions that the shelf could collapse again if global temperatures keep rising, triggering a chain of events that could raise sea levels around the world. "From a scientific point of view, that's really exciting. From a personal point of view, that's really scary," said Bertler, a senior research fellow at the Antarctic Research Centre at the Victoria University of Wellington. The ice shelf acts as a natural barrier protecting massive amounts of ice in West Antarctica, and that ice also could fall into the ocean if the shelf fell apart. Scientists say West Antarctica holds enough ice to raise sea levels by between 2 meters (6.5 feet) and 6 meters (20 feet) if significant parts of it were to collapse. Ted Scambos, the lead scientist at the National Snow and Ice Data Center at the University of Colorado, said that even under the worst case scenario he thinks it would take at least 500 years for West Antarctica's ice to melt. However, he said a discovery of sediment would indicate a significant portion of the ice shelf is under threat of becoming unstable again, and that the implications were "huge." Bertler hopes the material she recovered will help her to estimate by the end of this year whether it will take 50 years or 500 years for the ice shelf to collapse at the current rate of climate change. Those answers should prove important for policymakers who, she said, may need to decide whether to build sea walls or move populations to higher ground. Bertler's project is one of scores that take place on Antarctica every Southern Hemisphere summer. To scientists, the continent's pristine habitat offers a unique record of the planet's weather and a laboratory for studying the effects of climate change. Studies indicate that while the Arctic has suffered what scientists consider to be alarming rates of ice loss in recent years, the Antarctic ice shelf has remained relatively stable despite having have lost ice in recent decades. Research in Antarctica creates huge logistical and personal challenges. Bertler's camp on Roosevelt Island is a three-hour flight from the nearest permanent Antarctic outposts, Scott Base and McMurdo Station. The island is surrounded by the Ross Ice Shelf, the world's largest mass of floating ice, covering an area the size of Spain. Even during the spring and summer months when Bertler's team was working there, the temperature sometimes dropped to minus 25 C (minus 13 F) and there were frequent storms and thick fog. At one point bad weather even compelled logistics experts to prepare a plan to keep the 14-member team there through the Antarctic winter, four months of almost total darkness and temperatures that can drop to minus 60 C (minus 76 F). The weather improved, but the round-the-clock daylight of the Antarctic summer is grueling enough. Bertler, 42, who has spent nearly every summer there for 14 years, says its boundless frontiers can feel like a prison, though she has grown to love the exceptional landscape. While on the island, the team's only form of communication was three satellite phones. Every person carried a GPS unit in case he or she got lost in the fog or storms. The crew worked 10-hour shifts, read, occasionally skied cross-country. Some found it difficult to sleep in permanent daylight. "Everything becomes quite primal, in a way," Bertler said. "You're just thinking about your daily survival, being safe, and doing the work that you're there to do." The team used a sophisticated drill to collect cylinders or cores of ice. To ensure the samples stayed cold enough to get safely to New Zealand, the team had to do something that seemed counterintuitive: import a freezer to Antarctica. Still, the thousands of years of history collected in the ice cores almost melted away on the voyage home, when huge waves knocked out power to the freezer and swamped a backup generator. It was 36 hours before a technician could get on deck and restore power. But the ice stayed cold enough and reached the project's base in Wellington, the New Zealand capital, last month. The cores consist of sandwich-like layers of ice, formed when annual snowfall compacts to a fraction of its original depth. Bertler said she believes most of the ice she has collected is less than 40,000 years old, although the final pieces near the rock bottom could be up to 150,000 years old. The material Bertler thinks may be marine sediment came from 760 meters (2,500 feet) deep. Richard Levy, a New Zealand scientist who specializes in past climates and who was not involved in Bertler's research, said the project provides a high level of detail about climate change over relatively short periods of time. The layers of ice allow scientists to measure atmospheric gas levels on an almost annual basis going back thousands of years, he said. That complements rock-drilling work Levy and others have done in the Antarctic interior, which tracks climate change over longer time horizons of several million years, he said. Bertler's project has taken about seven years to complete and cost about 11 million New Zealand dollars ($9.2 million), most of which has come from the New Zealand government. Scientists from Australia, Britain, China, Denmark, Germany, Italy, Sweden and the U.S. also are involved. Tim Naish, a colleague of Bertler's who heads New Zealand's Antarctic Research Centre, said that if Bertler has indeed found recent marine sediment, it could be significant. "It will provide insight into what happens when the Earth warms," he said.